Cassia spectabilis DC. ; C. carnaval Speg. ; C. exelsaShrad. Native to much of tropical America. Locations within which Senna spectabilis is naturalised include southern USA, Malaysia, Puerto Rico, southern and eastern Africa. Senna spectabilis is present and naturalised in Kenya and considered to be invasive in parts Tanzania (Henderson 2002) and Uganda (Mungatana and Ahimbisibwe 2010). Senna spectabilis is a common garden ornamental plant that also invades; forest margins, savanna, riverbanks, roadsides, waste ground and plantations. Senna spectabilis is a small, rounded deciduous tree, 7-10 m (max. 15) tall, and 30 cm in trunk diameter, with a spreading crown. Bole is short, tends to fork near the ground and is wide spreading with drooping, leafy branches. Bark smooth, grey with horizontal markings, many warts and short fissures, rougher with age with broad vertical bands of large lenticels (corky pores). Twigs stout, brown with light dots (lenticels), finely hairy; young parts softly pubescent. Leaves alternate, up to 40 cm, once-compound (pinnate) with 4-15 (max. 19) pairs of leaflets, each up to 7.5 cm; petiole 3-4 cm; rachis 10-20 cm (max. 35); stipules paired, threadlike, linear falcate, early caducous, about 1 cm long, without glands; leaflets narrowly elliptic, 3-7 x 1-2 cm (the lowermost petal usually much smaller and early caducous); base rounded, apex acute, mucronate; margin entire, upper surface glabrous, dull green and almost hairless, with many slightly sunken side veins; lower surface dull light green and soft hairy, sometimes hairless; petiolule short, about 3 mm long (Katende et al. 1995). Inflorescence large, terminal, lateral, leafy panicles, 15-30 cm (max. 90) long, which are branched and very large. Flowers many, fragrant, composed of 5 rounded hairy bracts, which are ovate, 4-5 mm long, caducous; pedicles 2-3 mm, velutinous. Sepals orange-yellow, unequal, ovate to suborbicular; 2 outer pubescent, 3 inner glabrous, larger, 5-7 mm long. Petals yellow, spathulate, unequal, broadly to narrowly obovate (egg-shaped in outline but with the narrower end at the base), 2-3.5 cm long, anthers opening by apical pores and a slit; stamens 7 large and 3 small sterile (staminodes). Pistil slender, curved, hairless; ovary glabrous, recurved; style and stigma inconspicuous. 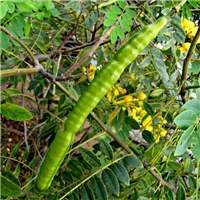 Fruit cylindrical or flattened pods ending in a short, narrow point, hard, not splitting open or slightly on 1 side; pendulous, more or less terete or slightly compressed, glabrous, glossy, annulate-septate, 18-25 (max. 30) x 1 cm, turning from green to black; with many cross walls about 3 mm or less apart, the seeds in separate compartments. Seeds 2.5 cm each division, 50-70, suborbicular, flattened, brown, about 5 mm in diameter; septae papery. Senna spectabilis has been introduced to Africa as an ornamental and a boundary marker. It timber is not highly valued but it produces good quality firewood. Senna spectabilis can invade disturbed forests, forest edges and gaps where it can establish and suppress the regeneration of native species. The precise management measures adopted for any plant invasion will depend upon factors such as the terrain, the cost and availability of labour, the severity of the infestation and the presence of other invasive species. The best form of invasive species management is prevention. If prevention is no longer possible, it is best to treat the weed infestations when they are small to prevent them from establishing (early detection and rapid response). Controlling the weed before it seeds will reduce future problems. Control is generally best applied to the least infested areas before dense infestations are tackled. Consistent follow-up work is required for sustainable management. Cut stump treatment using suitable herbicides including Tordon can be used to control S. spectabilis. When using any herbicide always read the label first and follow all instructions and safety requirements. If in doubt consult an expert. The editors do not know of any biological control programmes targeted at this species. Not listed as a noxious weed by the state or governments in Kenya, Tanzania and Uganda. Katende, A.B., Birnie, A. and Tegnas, B. (1995). Useful trees and shrubs for Uganda. Identification, Propagation and Management for Agricultural and Pastoral Communities. Regional Soil Conservation Unit (RSCU), Swedish International Development Authority (SIDA). Mungatana, E. and Ahimbisibwe, P.B. 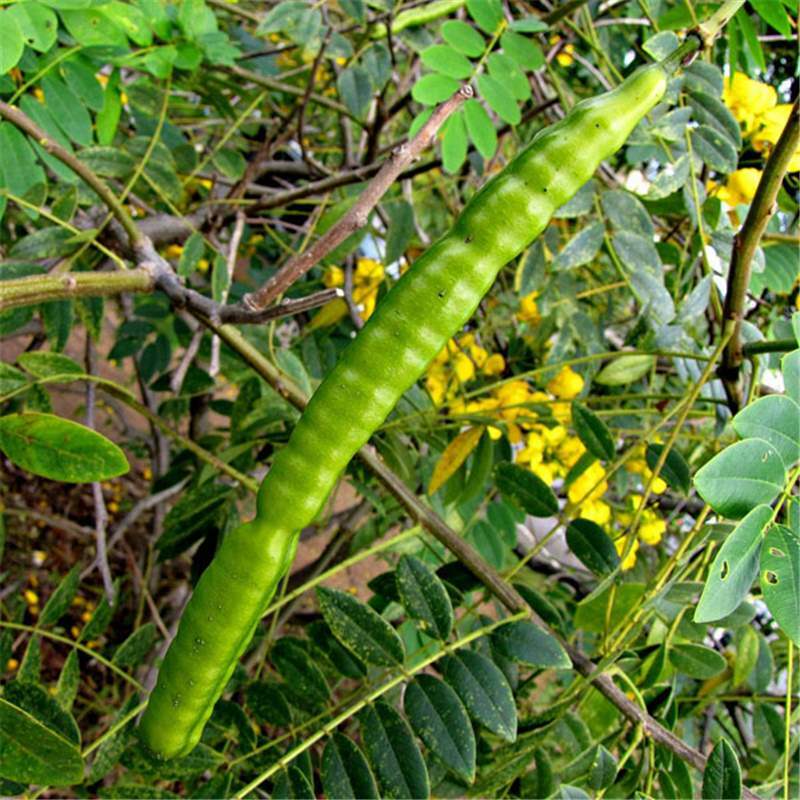 (2010).Quantitative impacts of invasive Senna spectabilis on distribution of welfare: a household survey of dependent communities in Budongo forest reserve, Uganda. Poster presented at the Joint 3rd African Association of Agricultural Economists (AAAE) and 48th Agricultural Economists Association of South Africa (AEASA) Conference, Cape Town, South Africa, September 19-23, 2010. Pacific Island Ecosystems at Risk (PIER). Senna spectabilis (DC.) H.S.Irwin & Barneby, Fabaceae (Leguminosae): plant threats to Pacific ecosystems. www.hear.org/pier/species/senna_spectabilis.htm. Institute of Pacific Islands Forestry, Hawaii, USA. Accessed March 2011. Agnes Lusweti, National Museums of Kenya; Emily Wabuyele, National Museums of Kenya, Paul Ssegawa, Makerere University; John Mauremootoo, BioNET-INTERNATIONAL Secretariat - UK. This fact sheet is adapted from The Environmental Weeds of Australia by Sheldon Navie and Steve Adkins, Centre for Biological Information Technology, University of Queensland. We recognise the support from the National Museums of Kenya, Tropical Pesticides Research Institute (TPRI) - Tanzania and Makerere University, Uganda. This activity was undertaken as part of the BioNET-EAFRINET UVIMA Project (Taxonomy for Development in East Africa).